We’re excited to announce our investment in Ike, a company that has an opportunity to revolutionize freight trucking, the backbone of the American economy. 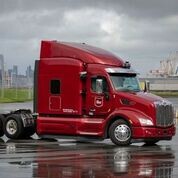 Ike is building self-driving technology for semi-trucks. Today Ike announced their $52M Series A and we are thrilled to be part, along with an exceptional group of co-investors — Bain Capital Ventures, Fontinalis, Basis Set, and Neo — who, collectively, bring a comprehensive and highly relevant set of experiences and domain expertise to support Ike’s growth. In a nod to trucking history, and also emblematic of how thoughtful this team is at their core, Ike is named after Dwight “Ike” Eisenhower, who jump-started the creation of our highway system by signing the Federal Highway Act in 1956. I just love that. Focus: choosing trucking as the application for AV technology. There are many plausible applications for autonomous movement technology. Over the coming decades I’m sure that we will see entire industries change and possibly be created with this varietal of robotics. What and why a team chooses to focus on something is the most important insight you get in to how they think and what motivates them. So, why trucking? First, is market size. In the US, $700B+ is spent annually to transport things via truck, accounting for 80% of all freight related costs in the country. It’s massive. If you look up from the device on which you’re reading this, likely everything you’ll see around you was once on a truck. This is easy to forget about if you are a city-dweller but take a drive on any major highway and you’ll see more 18-wheelers than you can count. Given our highway infrastructure thanks to the original “Ike” and the relative cost of other transportation options, this is not changing any time soon. Second, is market value. This is arguably more important, especially for nascent products. In the case of autonomous trucking, the commercial value it brings is immediate. Shippers want to save money as any additional dollars they retain flow directly to their bottom line. In an increasingly competitive Amazon-driven commerce environment, these dollars are even more valuable. Companies that move freight are called Motor Carriers and are comprised of groups of drivers who, unsurprisingly, are people. Truck drivers’ wages have decreased by 20–50% over the past four decades and large Carriers have 100% turnover of their drivers every year. Just like you, these people would prefer not to have a job that is lonely at best, and grueling, high-stress and life-threatening at worst. While the motivations to adopt AV in the trucking industry will certainly be economic, I’d argue that the social impact will be even greater. Approximately 1% of the US population are truck drivers, making it the #1 job in 29 states. The average age is 55 and 94% are men. Do you know what else that means? Drivers are disproportionately fathers who are on the road and away from their families. Autonomous trucking will become prevalent for long-haul highway driving first, meaning that these drivers will be in higher demand for short-haul round-trips that also let them sleep at home. From my time at Uber Freight, I know that the highest demand jobs were day trips, for this exact reason. Steve Viscelli, a professor at UPenn and author of what I think is the best read on the trucking industry, published a great overview of where the trucking industry is headed as AV-enabled trucks enter the ecosystem. Based on what I and the Ike team has seen firsthand, this is spot on. Lastly, the technical problem for trucking versus self-driving cars is simpler. If you’ve ever done a cross-country road trip, think about the experience of hitting cruise control through parts of entire states versus navigating city, or even suburbia, traffic. Yes, Nancy, Alden, Jur and team are extraordinary big-thinkers and want to revolutionize an industry. However, they are also deeply conscious of their approach to build a future that helps people by creating more and better jobs, not just build a product. Market timing: trucking is going digital. In 2018 an important new piece of well-intentioned legislation went in to place. The ELD mandate requires drivers to have an “electronic logging device” onboard while they drive. One likely outcome of this is that, in the short term, drivers will make less money, still. This is because drivers are held to federally mandated hours and, due to the inefficiency in the market, waiting unpaid at a port or warehouse for example, counts toward a driver’s hours of service. KeepTruckin has quickly built a meaningful business off of this mandate and companies like Uber Freight and Convoy are bringing loads online which will make it easier to integrate human-driven miles with AV-driven ones in the future. We believe the time to invest in trucking self-driving technology is now. There is enough legislative momentum and commercial demand is clear. And, the technology is now feasible, though still incredibly challenging to build. Earned insight: This is a systems problem first and a software problem second. The AV stack needed for trucking is amid a venn diagram of AV stacks for other applications. Ike began by licensing autonomous vehicle software from Nuro. Every expert I’ve asked believes the Nuro stack is the best AV software out there. Licensing it saved the Ike team the of time building the tech “basics”… I find reference to the “basics” here quite entertaining as it is still insanely challenging! This core AV technology needs to operate within a complex ecosystem of other software, hardware, people and environments — it is a systems problem first and foremost. The Ike team has been around (and around and around) the proverbial block when it comes to building AV technology. They’ve worked at every relevant company and have trusted industry relationships that matter. They also know the importance of building a real commercial product that is carefully designed, tested and built for safety from the very beginning. Not many individuals, and far fewer founding teams, understand how to build this kind of company. Alden, Nancy and Jur wrote about their perspective on solving a systems problem, a point of view that I could not agree with more. And, yes, Ike is hiring — no autonomous vehicle experience required! Reach out to them directly or email me at annie@redpoint.com and I’m happy to share more. We couldn’t be more excited to be heading down this road with them.